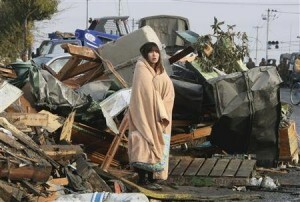 Yuko Sugimoto, March 13, 2011, looking in the direction of her son's destroyed kindergarten building. (by Yuriko Nakao, YahooNews.com) ISHINOMAKI, Japan (Reuters) – The young Japanese woman clutches a beige blanket tight around her shoulders as she stares into the distance. Behind her hulks twisted metal and splintered wood left by the tsunami that devastated Ishinomaki, her hometown. The photograph, taken by Tadashi Okubo at the Yomiuri Shimbun newspaper, was picked up by Reuters and other agencies around the world, becoming an iconic image of the March 11  disaster that killed 20,000 people. The woman’s name is Yuko Sugimoto. She is now 29 years old. When the photo was taken, around 7 a.m. on March 13, 2011, she was looking in the direction of her son Raito’s kindergarten, which was partly submerged and surrounded by piles of debris. Nearly two days after the quake she had yet to find the four-year-old. “At that point, I thought there was only about a 50 percent chance he was alive,” she recalled recently. Sugimoto was born and raised in Ishinomaki, a city of 150,000 known for its port and fishing industry before the wall of water unleashed by the 9.0 magnitude offshore quake roared in. Around 3,800 people perished, the highest toll for a single city. Delivering beverages for her business when the quake struck, she desperately tried to reach the kindergarten, but was forced to flee the tsunami, spending the night in her car. Reunited with her husband the next day, the two began making the rounds of evacuation centers — first by car, then by bicycle as fuel ran out. Her husband found a boat and paddled his way towards the kindergarten, but found no one there. It wasn’t until the next day that the couple heard that their son and other children had been rescued by the military from the roof of the kindergarten the morning after the tsunami. “When I saw Raito in the corner of a room, the next moment I was weeping so hard I couldn’t see anything,” Sugimoto said. She hugged him and checked his hands, his feet, every bit of his body. She even checked his smell, to be certain it really was him. Holding him tight, she said “Thank goodness, thank goodness,” over and over. Nearly a year later, Sugimoto stood in the same place, embracing her son and smiling. Behind her, the gently sloping road was clean, with cars and trucks stopped at a traffic light. Her smile suggests that her life is back on track, but that is not true. Though the debris was cleared much more quickly than she expected, it will take some time for Sugimoto and her family to get on with their lives. The house they built four years ago was submerged nearly to its second floor and they lost most of their belongings. What remains is a 31-year-mortgage of around 25 million yen ($310,000) they still have to pay. They now live in a rented house, but the lease expires next year. Returning to the old house would mean razing it and rebuilding from scratch. “I used to love the ocean, but ever since the disaster, I haven’t been to the ocean even once. I want to stay on in Ishinomaki, but far away from the ocean,” she said. Despite the financial burdens, Sugimoto’s priorities have changed. Though she once worked even through vacations, she has now quit her job to spend more time with her family. Reprinted here for educational purposes only. Visit news.yahoo.com/woman-iconic-tsunami-photo-looks-future-062111878.html for the original post. NOTE: Today's Daily News Article is a human interest story. Human interest stories differ from the regular news – they are sometimes referred to as “the story behind the story." The major news articles of the day tell of important happenings. Human interest stories tell of how those happenings have impacted the people or places around the story. 1. On what date did Japan's earthquake and subsequent tsunami occur? 2. How many people were killed in the disaster? 3. What attempts did Yuko Sugimoto and her husband make to find their 4-year-old son Raito, who had been in school at the time of the earthquake/tsunami? 4. How long did it take Yuko Sugimoto and her husband to find their son? 5. How have Mrs. Sugimoto's priorities changed since the disaster?